Bausch 40µ micro-thin Articulating Papers are extremely thin and tear resistant and are coated with liquid colors on both sides. These papers mark precisely because of the thin material; false or smear contacts can thus be avoided. The special coating with liquid colors facilitates accurate marking of all occlusal contacts or occlusal interferences. Moist occlusal surfaces such as gold, ceramic, polished metal or acrylic, which are difficult to examine, do not pose any problem. The special color coating with liquid colors consists of many color-filled microcapsules. Even the slightest masticatory pressure can cause the capsules to burst and thus release the distinctly visible color. Also repeated marking is possible because of color regeneration. Bausch micro-thin Articulating Papers are especially suitable for the two-tone representation of static and dynamic occlusion. The first step is to inspect the concentric contact (static occlusion) in red, and the second step to inspect the eccentric contacts (dynamic occlusion) in blue. The color sequence can, of course, be altered. Bausch Arti-Check®40µ micro-thin Articulating Papers are thin and tear-resistant papers which are coated with liquid colors on both sides. False or smear contacts can thus be avoided. These papers are also available in horseshoe-shape. The pre-cut paper can easily be applied without forceps or any other handling devices. All horseshoe-shaped papers come in plastic dispensers to facilitate removal with one hand. Bausch 40µ micro-thin Articulating Papers are extremely thin and tear resistant and are coated with liquid colors on both sides. These papers mark precisely because of the thin material; false or smear contacts can thus be avoided. The special coating with liquid colors facilitates accurate marking of all occlusal contacts or occlusal interferences. Moist occlusal surfaces such as gold, ceramic, polished metal or acrylic, which are difficult to examine, do not pose any problem. The special color coating with liquid colors consists of many color-filled microcapsules. Even the slightest masticatory pressure can cause the capsules to burst and thus release the distinctly visible color. Also repeated marking is possible because of color regeneration. 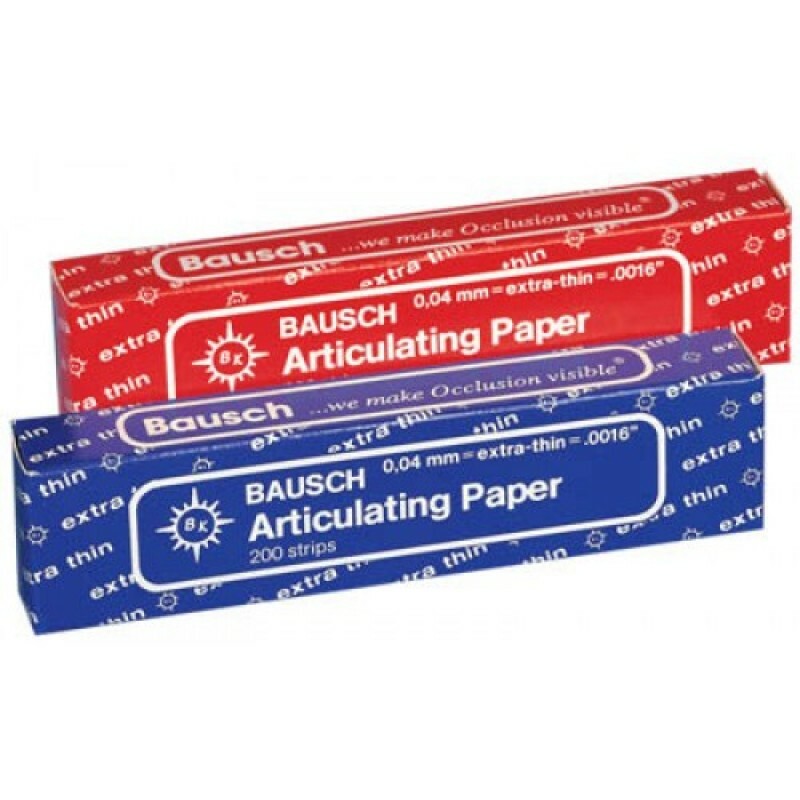 Bausch micro-thin Articulating Papers are especially suitable for the two-tone representation of static and dynamic occlusion. The first step is to inspect the concentric contact (static occlusion) in red, and the second step to inspect the eccentric contacts (dynamic occlusion) in blue. The color sequence can, of course, be altered.